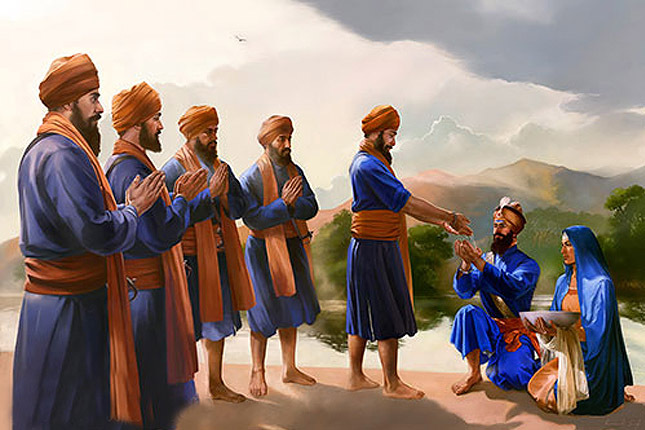 Sri Guru Gobind Singh Ji, on the occasion of Baisakhi of 1699 A.D., chose “Panj Piaras” who rose at the call of Guru Sahib to offer their heads, and created “Khalsa Panth”. At this historical occasion of great importance Guru Sahib prepared “Amrit” (Khandey Di Pahul) by reciting five “Banis” namely, Japji Sahib, Jaap Sahib, Sudha Swaye, Chaupai Sahib and Anand Sahib and baptized those chosen five Sikhs with it. Ḏasvai ḏuār kuncẖī jab ḏījai. Q : What is the need of taking ‘Amrit’, the soul should be clean ? Ans : It is correct that soul should be clean but still taking ‘Amrit’ is absolutely necessary. Please tell, was the soul of Guru Gobind Singh Ji unclean ? Guru Sahib himself took ‘Amrit’ from ‘Panj Piaras’ and gave directive to entire sikh sangat to take ‘Amrit’: (“Pratham Rehat yeh jaan khandey ki pahul chhake”). The soul may be clean but if, by obeying the directives of Guru Sahib, a sikh takes ‘Amrit’, his soul becomes more precious. Q : Guru has not yet showered grace, when guru’s grace will be bestowed on me, I will take ‘Amrit’. Ans : First of all tell me what is Guru’s grace? Is it a commodity ! and will Guru ji come himself to hand it over to you or do you think Satguru ji will come himself and will ask you to take ‘Amrit’. Now listen! Guru’s grace is neither an ordinary thing nor Satguru ji will himself come and will say “ My child take ‘Amrit’”. The Guru’s grace means – when a pious sikh of guru inspires you to take “Amrit’. It should be understood as Guru’s grace. Satguru ji manifests the grace through gursikhs (“Gursikhan ander satgur varte”). Ans : This thing is like that, if an ailing man says “let me become healthy, then I will go to doctor for taking medicine”. A man cannot triumph over his vices. He may struggle till the end of life but one or the other vice remains dominant over him. But with the help of Guru’s grace, eliminating of vices becomes much easier. You become Guruwala by taking ‘Amrit’ (Khandey di Pahul’), unite yourself with the shabad of guru and pray for eradication of vices before Guru. Only the grace of Guru can take away all the vices. Q : What is the use of taking ‘Amrit’ when after taking ‘Amrit’ some Sikhs consume alcohol and eat meat etc. Ans : Sikhism is a set of principles which are not changeable. If a criminal violates the law, it does not mean that the law is futile. Likewise if any sikh violates the rules of ‘Khalsa Panth’ he himself is culprit. If after taking ‘Amrit’ a sikh commits a bad deed, he himself is answerable for that. If somebody jumps into the well, will you also imitate him by jumping into the well? If you have not done so then by seeing his bad deeds why you are refusing to take ‘Amrit’. Ans : Right from Guru Nanak Dev Ji to Guru Gobind Singh Ji, there is only one soul, but the bodies had changed. The soul of Guru Nanak Dev Ji pervaded upto Guru Gobind Singh Ji. The same soul was kept in Sri Guru Granth Sahib Ji, by Sri Guru Gobind Singh Ji (“Jot oha jugat sae, sa kaya pher paltea). Believe it, ‘Amrit was given by Guru Nanak Dev Ji. also which was called “Charan Pahul” and was converted into “Khandey Di Pahul” by Sri Guru Gobind Singh Ji, according to the need of the times. If anyone is sikh of Sri Guru Nanak Dev Ji it is compulsory for him to adopt the principles of tenth Guru Nanak Sri Guru Gobind Singh Ji, and on that basis taking ‘Amrit’ is compulsory. By not abiding by the directives of tenth Guru Nanak no one has the right of being called as sikh of Sri Guru Nanak Dev Ji. Q : Wearing Kakaars is difficult therefore we cannot take ‘Amrit’. Q : Taking ‘Amrit’ and becoming armed was the need of the times of Sri Guru Gobind Singh Ji because that was the time of battles. Now the times have changed and there is no need of taking ‘Amrit’ and becoming armed. Ans : Taking ‘Amrit’ and becoming armed is not the need of some particular time. This is an eternal grace bestowed by tenth Guru Nanak Sri Guru Gobind Singh Ji. Taking ‘Amrit’ is the eternal directive of Guru Sahib which is not subject to time. Therefore it is essential for every sikh to take ‘Amrit’ and adopt the principles given by Guru Sahib. Becoming armed is the need of modern times also as it was in the past because the danger from man to man still exists. 1.Five Kakaar : To keep five “Kakaars” ( Kesh, Kangha, Kachh, Kara and Kirpan) was made compulsory after taking “Amrit”. 2. Five Banis : To recite five Banis daily( Japji Sahib, Jaap Sahib, Sudha Sawaye, Chaupai Sahib and Anand Sahib) in the morning and in the evening So Dar Rehras and at night Kirtan Sohila. 3.Only Guru Sri Guru Granth Sahib Ji : After taking Amrit, Guru of a Sikh is only Sri Guru Granth Sahib ji. 4.No Discrimination of Caste : To treat all human being as equal. There should be no discrimination of caste or creed. 1.Cutting Hair : Cutting hair is strictly forbidden in Sikhism. from your head down to your toes, no hair is to be plucked, cut, burnt or pically/surgically removed. 2.Intoxication : Consumption of alcohol, drugs, tobacco and other intoxicants is not allowed. Intoxicants are strictly forbidden for a Sikh. 3.Adultery : In Sikhism, the husband and wife must be physically faithful to one another. The women other than wife should be treated as sisters and mothers. And for women all other men are just like fathers and brothers. 4.Meat :Sikhs are strictly prohibited from eating meat. Register your name for Amrit Sanchar.